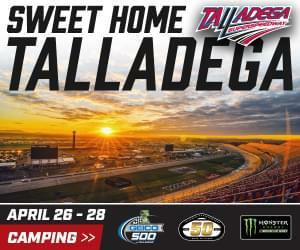 The UMP Has Your Tickets To Talladega Superspeedway Race Weekend – April 26-28! Talladega Superspeedway is celebrating 50 Years Of Speed, and The UMP has your tickets to join the celebration during Race Weekend from April 26-28, with tickets to the General Tire 200 (Friday, April 26), the MoneyLion 300 Race in the NASCAR Xfinity Series (Saturday, April 27), and wrapping up the weekend on Sunday, April 28 with the GEICO 500, part of the Monster Energy NASCAR Cup Series! Plus, not only will you get tickets to enjoy all 3 great weekend race events, but you’ll also get access to the Saturday Night Infield Concert at Talladega Superspeedway! Get more race and ticket information at TalladegaSuperspeedway.com or call 855-518-RACE (7223), and listen to Lockdown Coverage with Arky Shea and Jason Marks weekdays from 2-6pm for your chance to test your Talladega knowledge and get in and win your tickets with The UMP!